Order your Date Stamps Today! Many Sizes and Font Styles. Dater comes in One Color or Two Color. Dater and comes with 10 year date band. Trodat Dater Self Inking 2 Color. Customized with your custom text and font style. Dater comes in one color or two color and comes with 10 year date band. Thousands of imprints and date stamp is re-ink able. 1.25 in. x 1.25 in. Fast Shipping. Trodat Dater Self Inking customized with your custom text and font style. Dater comes in one color or two color and comes with 10 year date band. Thousands of imprints and date stamp is re-ink able. 1.25 in. x 1.25 in. Fast Shipping. Trodat Dater Self Inking customized with your custom text and font style. Dater comes in one color or two color and comes with 10 year date band. Thousands of imprints and date stamp is re-ink able. 1-5/8 in. x 1-5/8 in. Fast Shipping. Trodat Dater Self Inking customized with your custom text and font style. Dater comes in one color or two color and comes with 10 year date band. Thousands of imprints and date stamp is re-ink able. 1-1/2 in. x 3 in.. Fast Shipping. Trodat Dater Self Inking 2 Color. Customized with your custom text and font style. Dater comes in one color or two color and comes with 10 year date band. Thousands of imprints and date stamp is re-ink able. 1-9/16 in. x 2-3/8 in. Fast Shipping. Trodat Dater Self Inking customized with your custom text and font style. Dater comes in one color or two color and comes with 10 year date band. Thousands of imprints and date stamp is re-ink able. 1-9/16 in. x 2-3/8 in. Fast Shipping. Trodat Dater Self Inking customized with your custom text and font style. Dater comes in one color or two color and comes with 10 year date band. Thousands of imprints and date stamp is re-ink able. 1-1/8 in. x 2-3/4 in. Fast Shipping. Trodat Dater Self Inking 2 Color. Customized with your custom text and font style. Dater comes in one color or two color and comes with 10 year date band. Thousands of imprints and date stamp is re-ink able. 1 in. x 1-5/8 in. Fast Shipping. Small Printy Line Dater Self Inking ( DATE ONLY). Choose Ink color. Thousands of Imprints and Dater is re-ink able.date size 3/32. Small Printy Line Dater Self Inking (DATE ONLY). Choose Ink color. Thousands of Imprints and Dater is re-ink able. Date size 1/8" high. 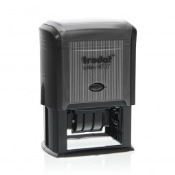 Trodat Dater Self Inking customized with your custom word before date. Dater comes in one color and comes with 10 year date band. Thousands of imprints and date stamp is re-ink able. 1 in. x 3/8 in. Fast Shipping. Trodat Dater Self Inking includes the following phrases below. Dater comes in one color and comes with 10 year date band. Thousands of imprints and date stamp is re-ink able. Approximately 1/4" x 1 3/4"
Small PrintyLine Dater Self Inking (DATE ONLY). Choose Ink color. Thousands of Imprints and Dater is re-ink able. Date size 5/32" high. Trodat Dater Self Inking customized with your custom text and font style. Dater comes in one color or two color and comes with 10 year date band. Thousands of imprints and date stamp is re-ink able.1 in. x 3/16 in. Fast Shipping.